Set up a passage type RFID readers in the storage entrance of finished products, it can realize to read a batch or multi-batch storage information of finished products, relative to the bar code scanning mode, it can greatly improve the speed of information acquisition and reduce the manual scanning bar code error probability. The goods allocation are marked by RFID tag in advance and the information is stored in the information system, in the process of finished products move the storage or out of the storage, the information system will distribute goods allocation automatically, and through the forklift car computer and RFID equipment automatically identify, distribute goods allocation to guide the forklift driver to do out of storage operations, after the operation is completed, the system will automatic generation finished products and goods allocation information and automatically associates it to realize the automatic and real-time update of the stock information. RFID automatic identification technology realized automated processing for most of the work link, completely change the current situation of the workers take paper outbound order to find the goods allocation at present, the maximum extent to meet the fast and accurate requirement of out of storage link. RFID logistics management system can identify the goods very fast, according to the system outbound requirement, it can quickly identify whether the goods are targeted outbound goods, it can realise the error outbound alarm and correct outbound data for the record. 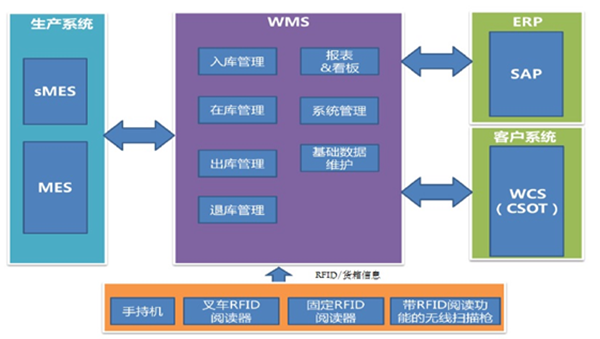 RFID logistics management system, from bottom to top is divided into four levels, respectively is the physics homework layer, acquisition and interaction layer, RFID data service layer, enterprise application layer. Physics homework layer: warehouse physics layer including storage, reservoir area, three-dimensional shelf/level library, storage location, container, forklift, field operation and so on. Field operation including inbound and outbound goods, inventory, order picking, transfer, library, etc. To realize the fine management of a single storage location and container, all valid storage location and container in warehouse is asked to install RFID tag. Data acquisition layer: including all kinds of field data collection and user interactive device, including RFID hand-held terminal, RFID stationary type reader, RFID vehicle-mounted reader, forklift vehicle-mounted computer, wireless bar code scanning gun with RFID read function, etc. Mainly offer the user operational guideline, field data acquisition and data entry, etc. RFID data service layer: to supervise and control the system of RFID equipment and related equipment, data collection, caching, filtering, control instruction and related data collection, distribution, etc. Data service layer with the way of system software service running on the system server, to provide RFID data of application layer and data acquisition interaction layer and data service of related control instruction to user. Enterprise application layer: provide for warehouse dispatching management center, remote management center for user management interface, also provides report forms and data inquiry service, electronic display board and other service at the same time. Management center to outbound task list, transfer storage task list, library movement task list, inventory planning, management control, data monitoring, etc are supplied by enterprise application layer. 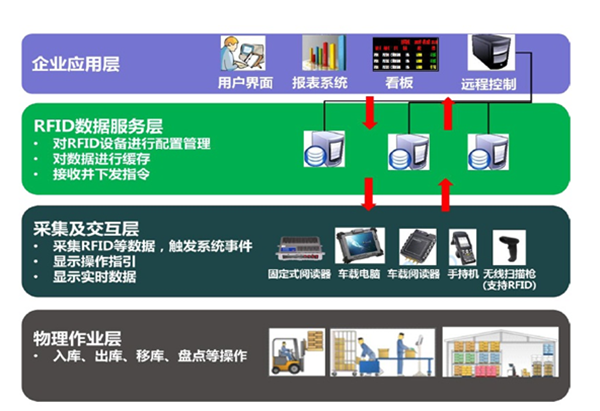 RFID warehousing & RFID logistics management system construction should be unified data standard, unified software and hardware, using mature and reliable technology with practicability give priority to both advanced and scalability, and so on. Inheritance: guarantee system and the exsiting information system, the compatibility of equipment and structure, make the best use of exsiting system. Practicalbility: maximum meets the needs of the business application, simple operation, easy to maintenance. Advancement: system design has proactive. Use RFID technology to improve the storage system management has become a trend at present. Scalability: when design the system need to consider the business capacity of storage link, the needs of function extension and the interface of other business link (ERP. WMS system interface).